You've seen the evolution chart, right? The one that starts with a monkey and ends up with a human. Imagine something kind of like that, but with cosplay. This is Mel Kishida. He's an illustrator best know his work on anime Hanasaku Iroha and the Atelier video games. A few years ago, he posted this photo online, wishing everyone a happy Halloween, adding, "Trying with all my might to be fashionable." More amusement! The image was viewed over 400,000 times, and it became a meme of sorts in Japan. Epic. Simply epic. Likewise, the image became a meme online in Japan. 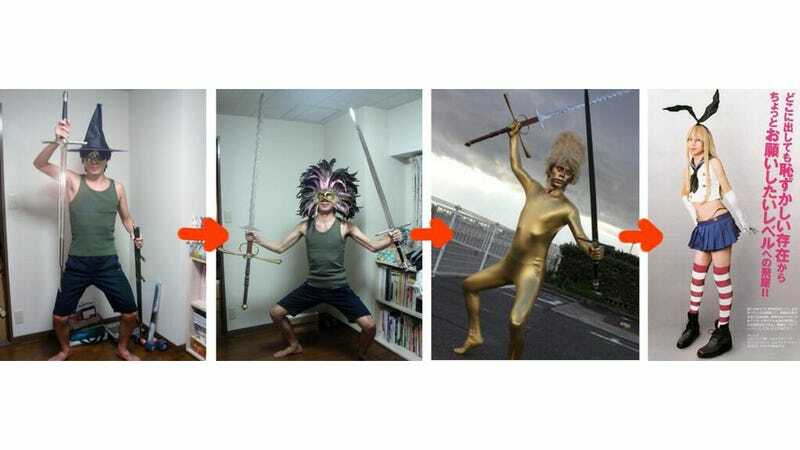 However, this year Kishida has pushed the envelope even further with his latest cosplay. Amazing. He is cosplaying as a character from Kantai Collection. How ever will he top this? Ladies and gentlemen, Mel Kishida.